Dogs are indeed man's (and woman's) best friend. They're loyal and amusing, but above all, they offer unconditional love. These traits make dogs perfect companions for one of our pet-friendly Springs Apartments homes. Are you thinking about adopting a dog? Maybe you already have one sharing your home. Here are some of our favorite tips from residents for keeping your adorable pooch comfortable and happy. No matter how much you prepare, it's unrealistic and unfair to bring home a dog that's not cut out for apartment home living. We welcome many larger breeds at our Springs communities, but temperament is more of a consideration than size. Small breeds that are high-energy or given to frequent barking will have more trouble adapting than a larger breed that may not require a lot of attention. Dogs need physical activity as much, if not more, than you do. Pent-up energy can result in unwanted behaviors such as barking or chewing on furniture. Down the road, lack of exercise can cause weight and health problems. Make sure you are committed to taking your dog outside at least twice each day, even if it's just for a quick walk. All of our Springs communities have onsite off-leash dog parks for your convenience. 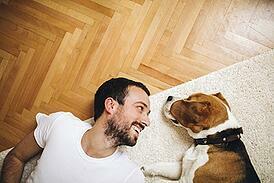 Your pet can romp around to his heart's content and even make a doggy friend or two. Everyone needs some quiet time, and dogs are no exception. Designate a certain spot in your home as a dogs-only zone. Furnish it with a plush doggy bed or cushion along with his food and water and some favorite toys. If you use a crate, make it as comfortable as possible. Set specific times of the day for feeding and potty breaks. Your dog's body will adapt to the schedule and it will be easier on both of you. As with any roommate, it's important that your dog knows and respects house rules. Do some homework and plan an effective training program as soon as possible. If you don't have the time, or you're not comfortable doing it, it's worth the cost of having your dog trained professionally. If you adopt a dog from a shelter, many of them spay or neuter animals automatically. Even though your dog will not be roaming around the neighborhood, neutering has vital health benefits such as reducing aggressive behavior. We value your dog's comfort and welfare as much as yours. Our friendly Springs management teams are happy to answer any questions you may have about our pet-friendly communities.